23 essays by some of the most prominent leaders in Unitarian Universalist Paganism bring Pagan and Earth-centered theo/alogy to life for a new generation. 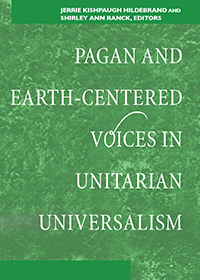 These 23 essays by some of the most prominent leaders in Unitarian Universalist Paganism bring Pagan and Earth-centered theo/alogy to life for a new generation. Featuring the writings of both clergy and laypeople, this vibrant collection demonstrates the many expressions of nature-based spirituality and the ways they feed the souls of so many. The essayists describe a broad array of practices, including Wiccan traditions, Neo-Pagan rituals and celebrations, worship of the divine feminine, and nature-based beliefs and practices that bring us into harmony and balance with our natural environment. Contributors also describe the development of nature-based theo/alogy within Unitarian Universalism—including the organization of the Covenant of Unitarian Universalist Pagans, the addition of the sixth Source to the UUA bylaws recognizing Earth-centered spirituality, and the integration of Pagan practices into congregational life. We have learned that the original word Paganus simply meant “country person.” As Christianity spread, it was strongest in the cities, and the country people often kept to their own old traditions. So Pagan or “country person” gradually became a derogatory term for non-Christians. When we came to discuss the title of this book, we decided to be inclusive and to use both Pagan and Earth-centered to describe the voices included. But what unites everyone with different belief systems and practices who identify with either of these terms within Unitarian Universalism? Broadly stated, we place a special emphasis in our spiritual lives on the feminine aspect of divinity, the cycles of nature, the honoring of our ancestors, and the inherent divine and creative potential in all people. An essential—and remarkably heartfelt—introduction to the development and blossoming of Unitarian Universalist Paganism.